Bill Cudmore is one of the most recognizable faces at Denver Health. When you hear the 69-year-old hospital volunteer's story, you'll understand why he said it's so important for him to give back. 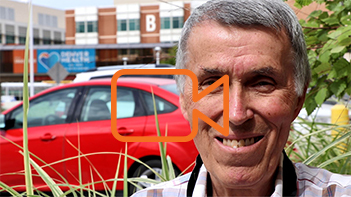 Watch Bill Cudmore talk about his Emergency Room experience at Denver Health and how that motivated him to become a hospital volunteer. On February 29, 2010, Cudmore was working for retired Denver Health physician Dr. Albert Soberanski and came into work feeling ill. He had been feeling extreme fatigue and didn't have an appetite. Dr. Soberanski listened to his heart and discovered he had an irregular heartbeat. Dr. Soberanski told Cudmore he needed to take him to the hospital right away, because he was on the verge of having a stroke. Cudmore says it was the first time he had gotten sick since 1983. Cudmore arrived at the Denver Health Emergency Department, and when he went to sit down in the waiting room, he fell down. Denver Health staff picked him up and brought him back to a room where they could run some tests. Cudmore says he was going in and out of consciousness. Doctors confirmed he had a stroke. Then, more bad news. Cudmore found out that he had stage one prostate cancer and would need to have surgery right away. Denver Health urology surgeon Dr. Fernando Kim operated on Cudmore for five hours. He would spend another three weeks at Denver Health recovering from the stroke and the prostate surgery. Cudmore said it took 15 months to fully recover, and he continues to manage the irregular heartbeat condition with his primary care provider, Dr. Mariah Hoffman. Once he learned the cancer was completely gone and he was feeling better, Cudmore knew what he had to do. "Denver Health brought me back, and so I wanted to give back," he smiled. Cudmore started volunteering at Denver Health in June of 2011. He has given his time in several different departments, including long-term care, the Emergency Department where he was treated, the Adult Urgent Care Center and, most recently. helping new employees get adjusted to Denver Health with our New Employee Orientation program. "When people come to this hospital, it can be a scary experience," Cudmore said. "I tell them, we're going to do everything we can for them, and then I tell them my story. I would not be sitting here today without all of the doctors, the nurses and everyone at Denver Health. This is a wonderful place. Denver Health is a place where you go to live." Cudmore will retire from his volunteer work at the end of December, but said he plans to return to Denver Health occasionally to continue helping out. Find out more about Denver Health's volunteer program here.